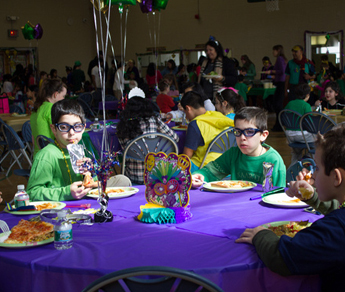 This year's SciCore Mardi Gras party featured its usual array of music, food, and good cheer. The party celebrates a Catholic religious holiday rooted in French culture which marks a feast before a time of fasting known as Lent. The vice-principal of SciCore Academy, Mrs. Poulos, comes from a Creole family background that is immersed in Mardi Gras French-American culture. She conducted the preparations for the party with her knowledge of this culture and prepared authentic Mardi Gras dishes for all to enjoy. 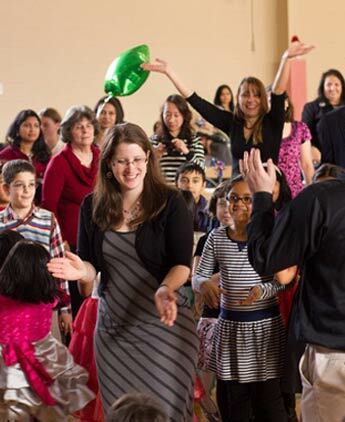 After the food, students, parents, and teachers enjoyed dancing, music, and activities. Students were reeling in anticipation for today's SciCore Christmas Party, an event that captured the holiday spirit in the multipurpose school gym. Classes were light on schoolwork and homework due to the two week holiday break from classes and the students could hardly wait to celebrate its beginning at the party. Mrs. Poulos and volunteers comprised of staff and parents helped decorate and organize the gym to match the festivities. In the kitchen, the volunteers organized various dishes of food which included dessert. When the party began, Santa Claus made an appearance to hear Christmas wishes from children. After the food, the DJ, Jeff Costello, blasted music throughout the gym that inspired many to get up and dance while others continued to enjoy their dessert. Merriment continued for the rest of the school day, concluded by farewells from Dr. and Mrs. Poulos. This year's SciCore Halloween Party was a ghoulish extravaganza of color and sound. Students wearing incredible costumes walked into the gym for lunchtime after the school day had ended. They were greeted with decorations and food that matched the holiday atmosphere. 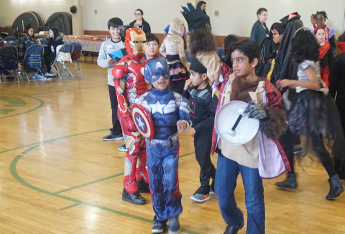 Dancing, costume contests, and musical chairs followed the eating to complete the Halloween party. Students were ready to enjoy the weekend after partying with their friends. Today marked the annual SciCore Pie Day, an event where students and staff bring various pies to celebrate the upcoming Thanksgiving holiday. A simple but effective party ensued, where a multitude of various pies were consumed in an extended lunch period. 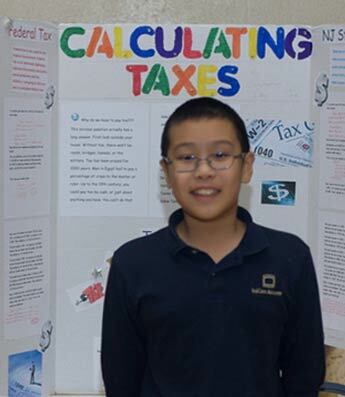 The 2015 SciCore Mathematics Fair featured math presentations from all grade levels that showed a comprehensive understanding of the material well above many of their age peers. Parents, teachers, and students set up their projects on tables in the multipurpose gym area and prepared their presentations on various topics based on the theme of the history of mathematics. Judges then proceeded to carefully examine each of the projects and graded them based on the students' presentation knowledge of the material and the layout of their posters. At the end of the fair, winners of the fair for both the middle and high schools were announced. The students enjoyed each other's company and projects after they were graded and spent the rest of the night learning about math and its applications. This evening at 7:00 PM Dr. Poulos hosted the annual SciCore application/preparation informational seminar. Parents and students gathered at the high school facility at 125 Railroad Ave. around a table to listen to a presentation on the various facets of the college application and financial aid processes. The group eventually separated into one-on-one dialogue with Dr. Poulos to discuss their current progress in the process and strategies for the near future.